Our travels with dogs first began as a desperate escape from the week-long heat wave and a house without central air. Our weekend trips had always revolved around getting home to feed and empty the dogs. This curfew severely limited our travel radius. But now, crazy with heat, we threw a suitcase, maps and the trusty AAA book into the van and trussed the dogs into the special "doggie seat belts" we'd bought to keep them from evil deeds. We had the dogs and the dog food. No curfew. We were free. Our learning experience was in motion. By the end of the driveway, Tristan was already free via a series of moves that would have made Houdini proud. Arthur was dangling off the seat like a parachutist caught in a tree. The seatbelts were an obviously flawed invention, so the dogs each took a bucket seat and we rolled down the highway. After an hour with no vet or groomer in sight, they took stock of the situation and decided a nap was the right thing to do. When traveling with dogs the main thing to remember is - the rest stop IS your ultimate destination. This was news to us. From the canine point of view, nothing can compare with the sheer excitement of the dog walk area at your average rest stop. Old dogs become young again, newer dogs go berserk - all is frenzy and tails twirling like helicopter blades. The odor bonanza at a rest stop is a dog's version of the Nightly News, People Magazine, Jeopardy, and the dictionary all rolled into one giant information overload. Trees are "read", other dogs are sized up and greeted or threatened, garbage cans are evaluated - all is bliss. Then comes one of life's major disappointments: the humans do not linger at rest stops. As humans, we wanted more. An ultimate goal was nonexistent, but the general plan was to proceed along Lake Huron's coastline, visiting lighthouses as we went, until we had reached a point where the temperature was bearable. By late afternoon we were within sight of the Mackinac Bridge and two wet, sand covered dogs were snoring on their bucket seats. We settled into a motel with lovely rooms- each with a doorwall leading out to the river dock. The next morning Tristan woke at 6AM and a flaw in our plan was revealed. We had left our fenced yard at home. I was now an integral part of "potty time". Wearing a robe and tennis shoes, I stumbled out the doorwall with the two dogs. The dogs did their deeds. I watched the sun rising over the river. It was picturesque - until the sprinkler hit me full in the face. Dashing madly through the rotating spray, I ducked back into the open doorwall. The room was dark and I was agitated that my husband was still blissfully asleep in the bed. I reached down to unhook the leashes and saw it - the stroller. We have no children. I squealed, turned, and ran head-on into the sprinklers again.. The doors had no numbers. I didn't dare risk another guess. I ran into the lobby, and down the hall, dogs flying behind me, and knocked on the door to our room. My husband had seen me outside frolicking with the dogs and assumed it was some crazy person knocking on the door - some poor fool who had the wrong room - so he ignored me. Finally I counted the number of doors to the lobby, splashed through the sprinkler counting one-two-three, tore through the correct doorwall, and waited for the police to take me away. As I told my husband of my adventure, horrid scenarios of crawling into bed with a stranger - or being that stranger and being unexpectedly trampled by wet dogs at 6AM - festered in my mind. What if he saw me run out the door. How many women with two cocker spaniels could there be at that motel? We left in a hurry. Calling on my limited Cherokee heritage, I gave myself a new name - "Travels with Dogs Woman" to commemorate my initiation by fire. Nothing could faze me now…except checking into a fancy hotel and finding out they had given us a room on the fifth floor and the dogs had never been in an elevator before…. Are you and your canine companion ready to hit the road? 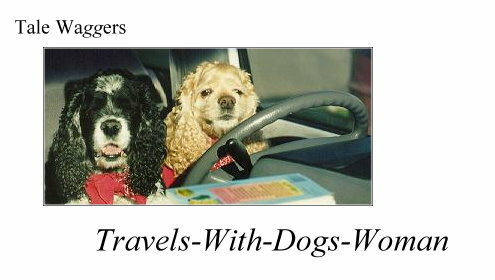 Read DOGS AT THE WHEEL - dogmama's tips for travel with dogs.